Music has an important place in my life. I started learning the violin when I was 9, however I encountered a whole new world in bass playing at 16, which led me to explore different genres, while meeting different souls along the way. Sessions with Martyrium 1: Recorded orchestral sounds on one of Martyrium’s albums, resulting in several layers of violin and double bass tracks. Sessions with Martyrium 2: Another session with the band adding various violin tracks. Sessions with Maria Abdilla: Collaborated with the artist to write a backing track for this beautiful song (incl. 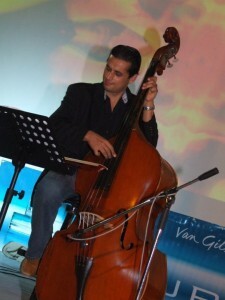 cello, djembe and double-bass). One fine day I stumbled upon a 60 year old double bass, and a new chapter kicked off. Together with a group of friends, having music as a common denominator, we started helping an MSSP missionary build a music and trades school for children and youths in the Bataan region, Manila (Philippines) – more on this at okmusika.org.